This conversion kit allows you to convert HQL hall radiator with energy efficient and long lasting induction-lighting. 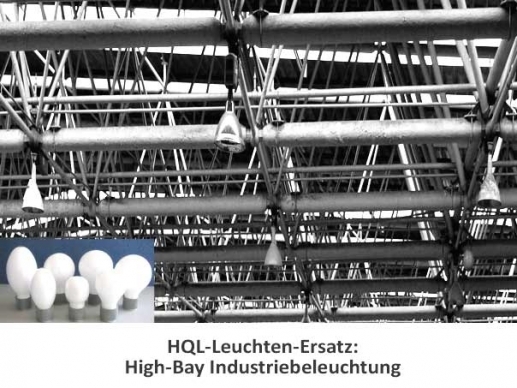 These are a direct replacement for 240 watt lamps HQL. 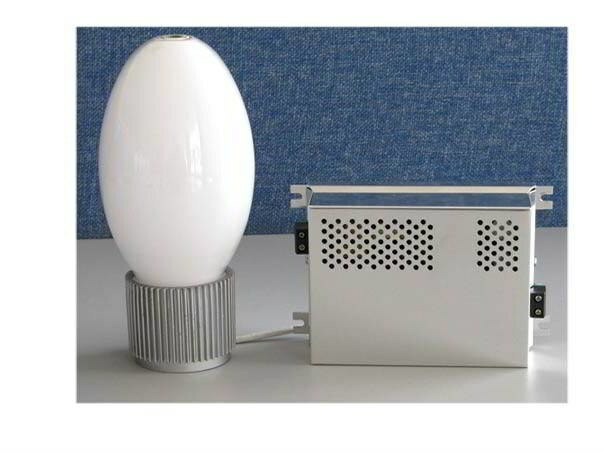 The 120 watt induction lamp conversion kit for 240 W HQL bulbs can be offered with 2700K (warm white ) and 5000K ( daylight white ) color temperature. The induction lamp produces a luminous flux of 8400 lumens (70 lumenm / watt ) and starts in less than 0.5 seconds at high contrast and uniform light. This conversion kit allows you to convert HQL hall radiator with energy efficient and long lasting induction-lighting. These are a direct replacement for 250 watt HQL lamps . The HQL lamp and the ballast can be easily removed and replaced by the induction lamp and the electric ballast. The ballast is mounted in the luminary and is thus better protected against external influences. The HQL lamp itself can be reused, but should first be cleaned. The elliptical shape of the induction lamp uses the existing reflectors of the HQL hall radiator in a perfect manner. A conversion is quite easy to do (15-20 minutes), but should be done by a qualified electrician. See also our conversion video. 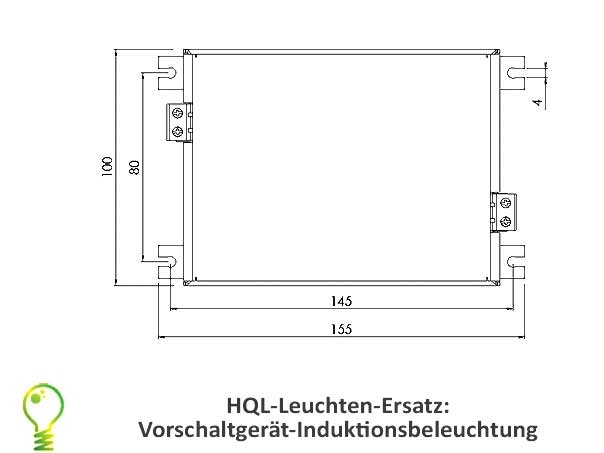 The 120 watt induction lamp conversion kit for HQL250 can be offered with 2700K (warm white ) or 5000K ( daylight white )color temperature. The induction lamp produces a luminous flux of 8400 lumens (70 lumenm / watt ) and starts in less than 0.5 seconds at high contrast and uniform light. It produces a very good color reproduction, coupled with low glare values. 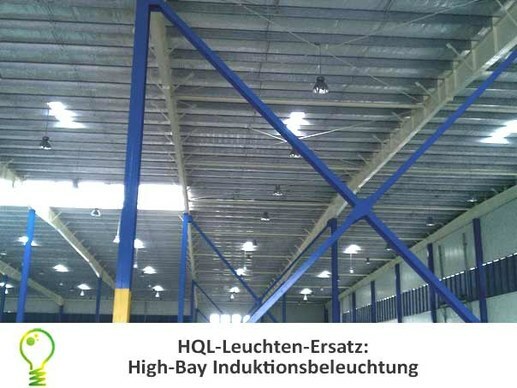 In addition to industrial and commercial buildings, it can therefore be used in commercial premises with high ceilings. With a lifespan of over 60,000 hours (7 years continuous operation) the induction-lighting is durable and saves maintenance costs in building management. It minimized frequent relamping at high altitude. 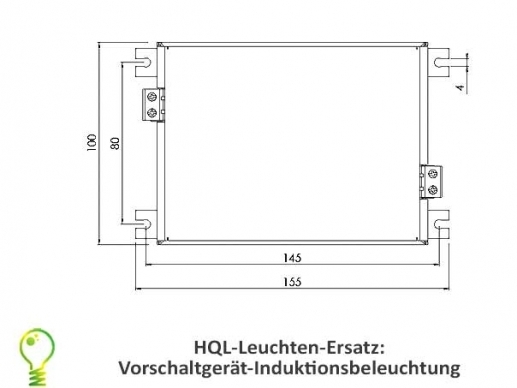 You have questions about our induction-light conversion kits for HQL lamps ? We will help you! Preferably personally ! Please contact us at the phone number : 0049-221-9924573 during normal office hours or mobile . You can contact us by e -mail or fax request. We also call you back . Included with this set are the induction lamp , external ballast, and operating manual. firing time: < 0,5 sec. 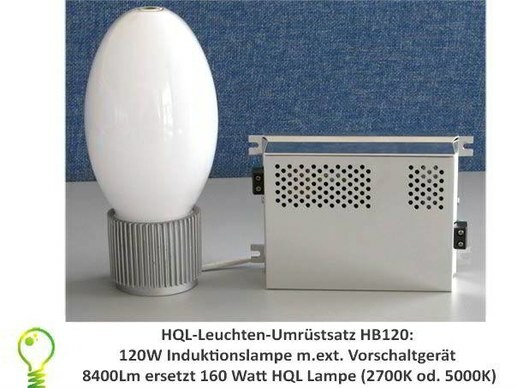 In April 2015 the import and production of mercury discharge lamps (HQL) / mercury-vapour lamps (HPMV lamps will be banned withing the EU. We are experiencing an increased demand for efficient replacement technology such as induction-light and LED-light. Often mercury discharge lamps can be converted to induction-light by replacing the bulb and ballast inexpensively and quickly to modern and efficient induction-lighting. In summary : In areas where the exchange of lighting is a huge hassle and circumstances and ongoing operation is difficult to interrupt .